When we are sick we go to the doctor and get some tests done to check out what’s going on inside our body. In the same way, how do we check out the spiritual status of our hearts? Luke gives us the way to have an internal check up of our heart. Luke 12:34 says “where your treasure is, there your heart will be also” This according to the Bible is a pretty clear indicator as to where the affections of the heart lie. 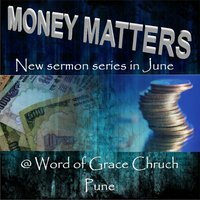 Does the bible forbid the acquisition of wealth? No. Duet 8:18 – It is he who gives us the ability to produce wealth. This is his grace upon our lives. Are we thankful for the jobs we have? Do we recognize it as the grace of God and not your efforts? God richly supplies us with many things to enjoy. 1Tim6:17. There are some streams of Christianity that promote the idea that poverty is next to godliness and some that promote prosperity as a sign of godliness. In the Bible we see people like Abraham, Isaac, David, Job and Solomon were very, very wealthy. And you have the poor widow, the apostles etc who were not well off. We are promised spiritual and material blessing. The bible however gives us principles on how to handle wealth. Wealth is neutral, how we handle it is what matters. The warning about money is this – those who chase after it will find trouble. Eg). Achaan – loved money and fell in to sin. Balaam decided to curse God for money. Delilah sold her lover for money. Judas betrayed Jesus for money. So how do we handle money rightly? Money has power – that is why we are warned. We cannot serve both God and money. Mammon is powerful. Verse1 – The church in Jerusalem were very poor. The Corinthian were rich and affluent. As Christians and as churches we have an obligation to help the poor. Paul tells us that the Macedonian Church i.e Philippi, Thessalonica and Berea were very generous. He was citing them as an example to provoke the rich Corinthians to give. What does giving involve? Giving involves money, but much more. We can give a meal, our home for someone to enjoy a holiday while we are away, bicycle, sewing machine or any possession. I may give someone a car, or I may freely loan it to others. There’s a great deal of giving that can take place even when I retain ownership – as long as I remind myself that God is the true owner, and I’m a steward of what He has given me. We must be careful that our ownership doesn’t involve possessiveness. Instead of buying stuff we rarely use, why not borrow it and give the money towards God’s purposes. How can we give in a way that glorifies God? Verse1 – Our giving should be motivated by grace. Giving can be an act of the flesh or a spiritual act. There is also a gift of giving but we are not talking about that. So if I don’t have the gift to give should I give? V.7 – we are commanded to give. We also need God’s grace to give and God’s grace is given to us freely without measure. Verse2a- the Macedonians were not rich – out of severe trial, they gave. They were severely persecuted and yet they gave. You may have difficult circumstances – illness, financial trouble etc , whatever it is – give. V2b – They gave out of overflowing joy. As you give you will experience much joy. So we give with faith. V3b – Is it sacrificial – they gave beyond their ability. When we give does it cost us, does it pinch us? Sacrificial giving is an integral part of a healthy church. Giving affirms Christ’s Lordship. It breaks the chains of Mammon that would enslave me and transfers my center of gravity to heaven. V3c - Voluntary – entirely on their own – of their own free will. It is always between you and God. Do it in secret. V4. Giving was a privilege and not an obligation or compulsion. In fact they pleaded to participate. V5. It was an act of love – they gave more than expected. Jesus who was rich became poor for our sakes so that we may become rich in every way. Jesus laid aside his majesty and died on the cross so that we could have the free gift of salvation and make us rich in every way. This would evoke a response from us that is full of gratitude. This is a summary of the sermon preached on the 11th of September by Colin D Cruz the pastor of Word of Grace Church . Who is God? What is He like? Different people have a different understanding of who He is. Our belief must correspond with truth. Eg) 5 Blind men feeling an elephant – One feels the tails and says the elephant is like a rope, the other feels the trunk and says the Elephant is like a tree, the other feels the ears and says the elephant is like a fan and so on. Which one is right? You may say all of them. They are all right when put together but not in isolation. In the same way there are many facets to God and we need to try and understand Him in all His glory. When we have just one pet idea about God, we no longer worship God we worship an image of Him and it becomes idolatry. Some people believe that God is too kind and loving to send people to hell. Does this image of God correspond with the truth? Even as Christians we can be in the danger of having a partial understanding or selective understanding of who God is. We must worship God in spirit and in truth. Rev1:17 -John was the disciple closest to Jesus and the one Jesus loved yet here what is John’s response? He feel face down as though dead when he encountered the glorified Jesus. One of the qualities of God is that he is Eternal – without beginning and end. “In the beginning ...” The same words are used in Genesis 1:1. Jesus the Word of God existed before matter, time and space. Some people think that Jesus came into existence only 2000yrs ago. They are in error. The difference between us and the creator is the difference between the sun and a candle. The essential nature of God is that he is infinite but we are finite. 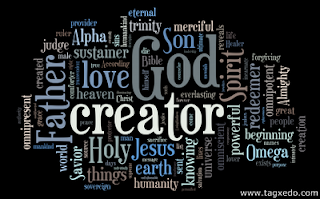 THE WORD – why is He called the word? Everything God wants to communicate is through His Son. If you want to be built up spiritually feed on the Word. That is why we have introduced the “Getting started “series of daily devotionals to strengthen you in the Word. John1:2 “And the word was with God”.They were close, there was unity. The word and God were one. It speaks of a close relationship and fellowship. 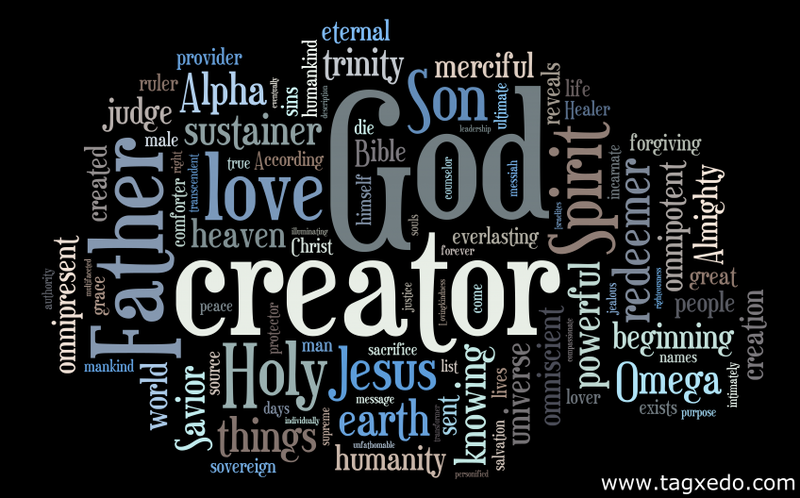 These are attributes of the Godhead. What does this imply for us? God wants to have fellowship with us not because He needs us. We need him. Set aside a time to communicate with God. Stay in fellowship with him. Brother Lawrence used to wash dishes in the monastery and he used that time to fellowship with God. When we become Christians God becomes our father and other Christians become our brothers and sisters. There was mutual submission and partnership in the Trinity. In the same way it is vital to build a relationship with one another. This is vital for the growth of the church. Invite people to your home and have a meal with them – make new friends. Our salvation is personal but not private. He is co equal with God – not a little lower. Jesus is Coequal. Submitting does not mean being inferior. It’s a different role. Jn1:10 the world was made through Him. Here are some more attributes of God – He is Eternal, omnipresent (Matt18:20), omniscient, omnipotent, sinless, unchanging ( Heb15:5), Sovereign (Matt28:18-20). As you study the Bible you will discover many more attributes of God and grow in your understanding of Him and this will deepen your worship of Him. This is a summary of a sermon preached at Word of Grace church by Bill Berry who has been instrumental in bringing the pastors of the city ( across many cities) together for an annual 2 day Prayer Summit with the intent of building unity in the body of Christ. He was the lead pastor of his church for 31 years and has now handed over to a younger man to take the work on. He speaks with much humility and experience of a man who has walked the walk. As Christians we need to answer two very important question viz? Who is Jesus? And “Who am I?” Sometimes we spend our whole life trying to figure it out or trying to prove it by making a name. Jesus submitted to the Father’s will and only did and spoke what the Father and Spirit did. We are to be responders to the initiatives of God. We have to learn to live that way. Jesus was baptised by John and the Holy Spirit comes upon him. Jesus needed the Holy Spirit to do the ministry God had called him to do. The Holy Spirit is your enabler too. Jesus lived under the Father’s authority and was empowered by the Holy Spirit. All 3 persons of the Trinity are in view at one time at the time of Jesus’ baptism. This is one of the critical points in Jesus’ life on earth. The Father is reminding the son of his identity before he goes into ministry i.e “the beloved son”, even before he can do anything. Often we are trying to prove our identity. We are trying to get recognition and importance in the world. 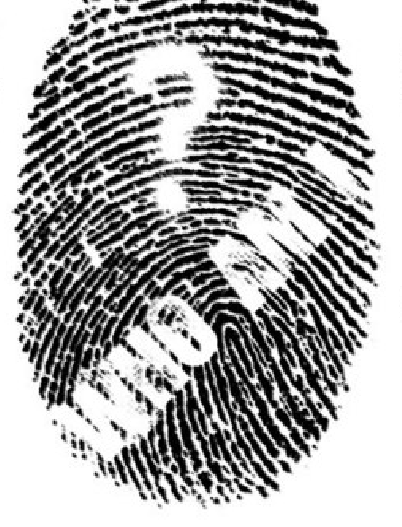 You don’t have to prove your identity in ministry. You prove who you are by your belief. You are God’s beloved children. Jesus is tempted in three areas in the desert : His identity, the need to recognition and the need for glory/power. We as Christians and those in leadership will be tempted in these three areas as well. We need to watch out for these. Abraham and Sarah – Tells the king that Sara is his sister. Ananias and Sapphira sold property and held some back – they were insecure about their provision. We must be able to find security in Jesus alone. God wants you to trust his promises and His word. Satan took Jesus to the highest point in the temple and challenged him to do something spectacular that would make him famous. We face the temptation to do something spectacular to again the approval of people – to make a name for ourselves. We all want people’s approval. Why do I act humble? – is it in my heart or am I looking for people’s appreciation. What is the motive? One of the basic needs is to be loved. If you are not secure in God’s love you will keep seeking love. When you seek love you cannot love. Power and control: Leaders particularly fall for this. I’ll be recognized and will get my sense of value from the power I have. The Pharisees are a perfect example : if we don’t get it, the Romans will take our position. Jesus never sought for a position of power. He in fact practised downward mobility – he became nothing, he humbled himself. Therefore God exalted Him and gave Him a name above every other name. We strive for this because we want glory. We need to realize we already have a position of glory because we are sons of God. Live out your life out of the fact that God loves You. Ask yourself about the three areas of temptation – for security, approval and power – Why am I tempted to do any of these? Don’t live your life to prove who you are, but live your life out of who you are.